Visiting Mt. Rushmore was one of the main reasons I wanted to go on this 2,000 mile road trip. Anti-climactic? Sure. Just a hunk of rock with faces in it? Sure. Freaking awesome? Absolutely. Sadly, I was foiled by tons of rain and lots and lots of fog. 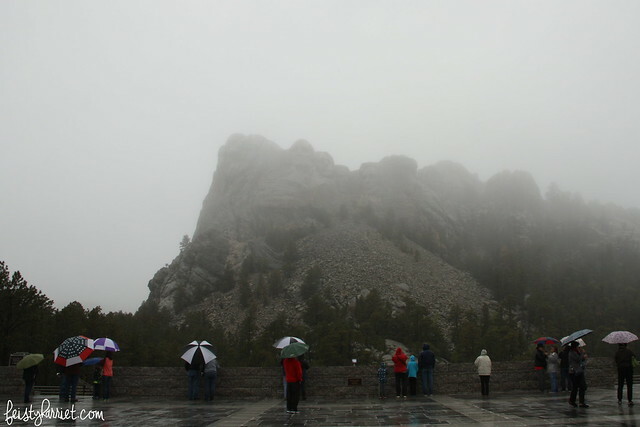 The rain was so heavy that my friend T and I simply stood there under umbrellas or the small overhang at the visitor’s center and stared at the fog for….probably 90 minutes total, waiting for it to clear just a little bit and more-or-less disappointed. I took a hundred pics with different camera settings and angles, hoping for some photo magic. Nope, no magic. My photo fairy godmother was busy or something because almost all of my pics turned out as a wash of gray-white fog with a few outlines of trees in the foreground. This was one of the “clearer” moments to see the mountain and her Presidential faces. The first thing you’ll notice is that there is actual SUNSHINE in these pictures…which lasted for about 45 minutes and I was glad we took the opportunity to see as much of this mountain carving as possible while the sun was out and the fog was at bay. Well…kind of glad. 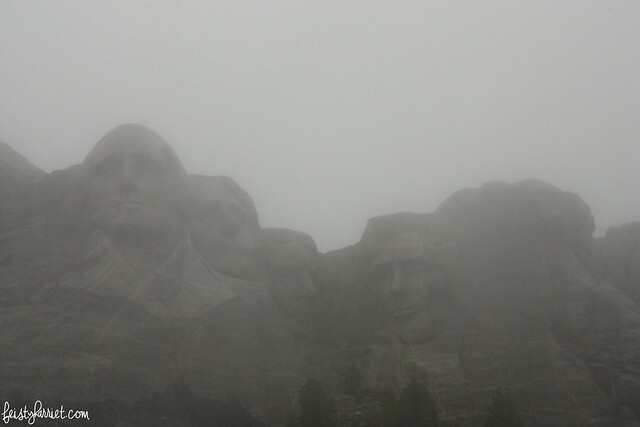 The 90 minutes we spent at Crazy Horse Memorial was the most frustrating part of the entire trip, rainstorms and picture-ruining clouds included. Chief Crazy Horse was a Lakota warrior most famous for defeating General Custer at the Battle of Little Bighorn (Custer’s Last Stand). 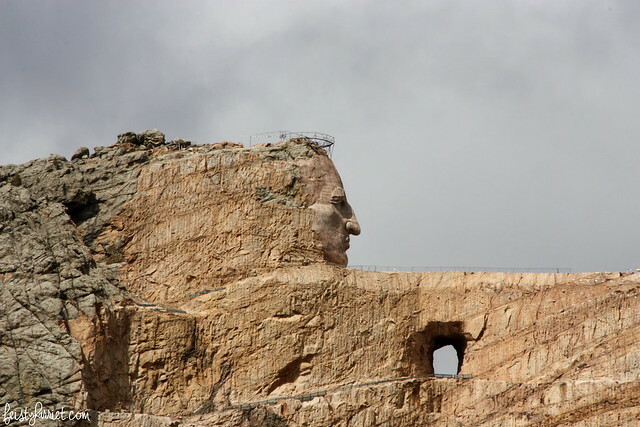 In the 1940’s Lakota Chief Standing Bear approached one of the masons/sculptors of Mt. 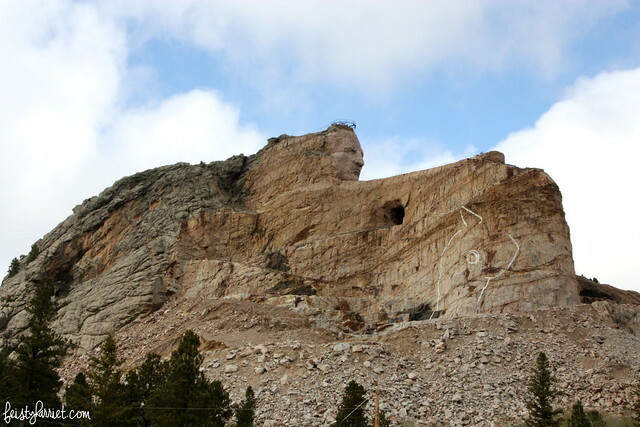 Rushmore and asked him to build a memorial to Crazy Horse and the Lakota people. This mountain is that memorial, although if we are being completely honest, it seemed to be more a memorial to Korczak Ziolkowski, mason/sculptor, and his family than a memorial to the Lakota. Korczak (Core-JACK) and his brood have lived near this hulk of granite for almost 70 years raising funds to complete their plans for a 600-foot tall sculpture, museum, and school for Native Americans. 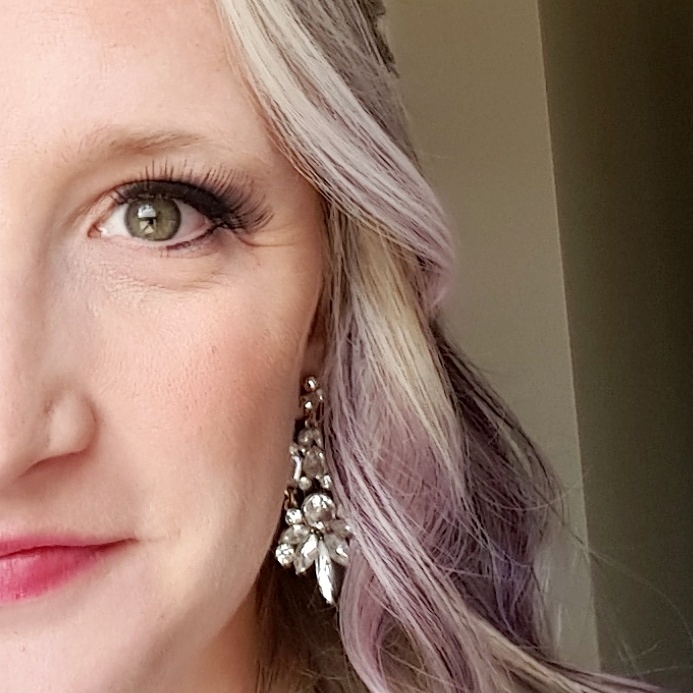 This all sounds lovely in practice, however the Ziolkowski (Zull-COW-ski) family refuses any sort of government funds–a fact that tell you about eleventy-million times–and the gowing is very very slow. The visitor’s center and “museum” are complete, but they are more a memorial to the Ziolkowski struggle than to the Lakota. Don’t get me wrong, there are a lot of Native American items in the museum, but the plaques simply state who donated the item and say NOTHING about the use or history of it. 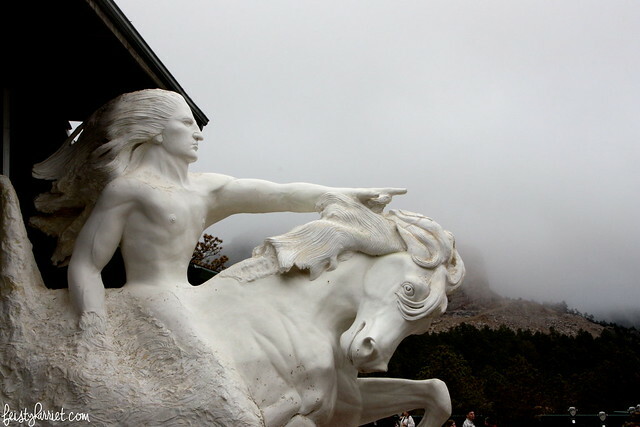 The marketing is all about the Ziolkowski’s and their determination to finish and fund this project, there is very little on Crazy Horse the man or the Lakota tribe, historically or currently. Outside of the actual carved mountain I found the whole thing very distasteful and rife with offensive political incorrectness. Honestly, there is a longer segment in the informational video about one of the Ziolkowski daughters who ran the gift shop (and an accompanying room in the “museum” dedicated to her life) than there is about Custer, Crazy Horse, the massive crimes the U.S. Government committed against the Native American people, or the current struggles or triumphs of the Great Plains tribes COMBINED. Wrongity-wrong-wrong. 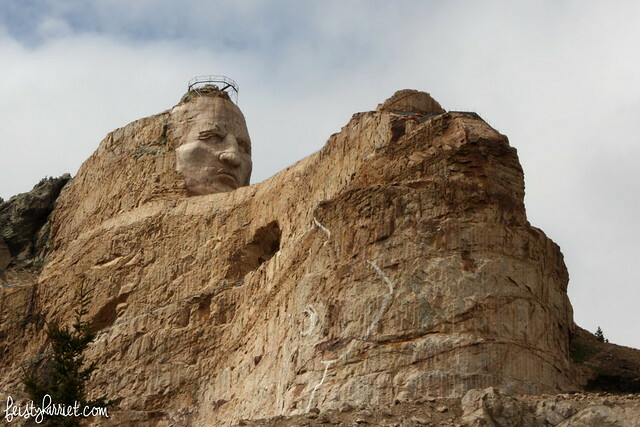 And this is what is complete so far after almost 70 years of work: Crazy Horse’s face and the top of his arm. Ok, I KNOW IT TAKES A WHILE TO CARVE A MOUNTAIN INTO A 600 FOOT TALL HORSE AND RIDER! I just feel like there is some gross mismanagement of funds on this particular project. “Keeping it in the family” has resulted in strange priorities, a lack of true business sense, and a skewed board of directors. Refusing any sort of governmental funding (which, I assume, also means grants from Arts foundations?) has slowed the process significantly and their marketing is abysmal and horrific. Honestly, their brochures look like a 7th grader made them in Microsoft Paint circa 1995. They tout education opportunities for Native American students, but I find it ironic that none of those opportunities include an internship in civil engineering, or drafting, or architectural blasting, or ANY of the activities that are required for completing this monument. Overall–in my opinion–a huge fail with a impressive partially-carved mountain behind it. 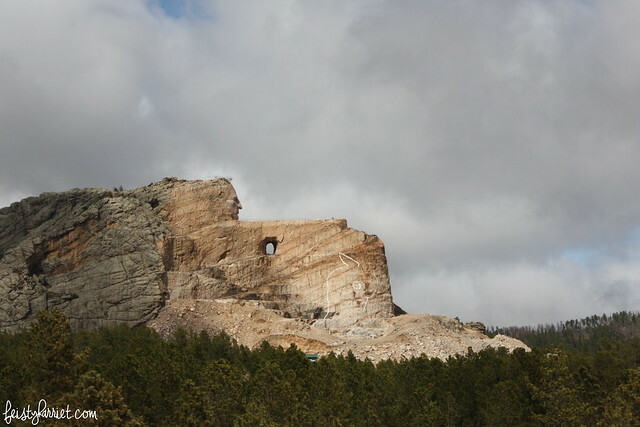 This entry was posted in Far Off Places, Feisty Harriet, National Park, Photography and tagged Crazy Horse Memorial, Mt Rushmore, Photography, South Dakota, Travel by Feisty Harriet. Bookmark the permalink. I would have been right there, ranting with you. Such a shame. Yep. It was just so obviously horrible to anyone with a wit of social justice knowledge. I would have been ranting too! Yep. 6 weeks later and I’m still irritated by the whole thing. Wow, that is amazing. Like, shameful amazing. What a missed opportunity.. and a mismanaged mess, as you say. It could have been such a powerful monument, but… man. Ugh. The worst part is that the family/memorial people THINK they are honoring the Lakota tribe and Native Americans in general…I think their heart is probably in the right place, but it is so, so, SOOO off point. Ugh-grrrrrr.